The new $81 million Western Grandstand at the Ausgrid Stadium in Newcastle will offer better accommodation to spectators as a result of an innovative engineering project undertaken by John Holland Construction with help from Coates Hire Industrial Services and Enerpac (A Division of Actuant Corp) . Compact high-pressure Enerpac hydraulic cylinders driven by some of Australia’s most advanced electric pumps were used recently to safely and delicately position the roof of the new Western Grandstand at Ausgrid Stadium that will play host to Newcastle Rugby League Club matches this year. The hydraulic technology employed at the sports stadium is applicable to a wide range of construction, infrastructure, resources and industrial projects involving the positioning of very heavy weights with very high precision and safety. Enerpac’s technology was employed at Ausgrid Stadium to lower the 1500-tonne grandstand roof incrementally until its cable supports took up the load. Twelve temporary roof props or supports had been placed into position while the roof structure was assembled. Built by John Holland Constructions, the 12,500-seat Western Grandstand features a cable-stayed cantilever steel roof measuring about 150 metres in length and 25 metres in depth. Prior to final positioning, the main weight of this flexible roof rested on the rear structure of the stadium, with the balance of the weight projecting forward onto 12 temporary tubular steel props supporting its leading edge. According to Consulting Structural Engineer Peter Burns, who worked with the Site Engineer for John Holland Constructions, Adam Towns, they needed to use a better, more finely-controllable lowering system than traditional arrangements using wedges or sand jacks to ensure precise positioning while protecting the roof against unwanted flexing as the temporary props were removed. The Enerpac system designed and supplied by Coates Hire Industrial Services included three compact hydraulic cylinders at the base of each of the 12 temporary supports. Contained within box structures fabricated from heavy steel angles, each of the 12 triple-cylinder installations included one RC1006 95-tonne single-acting cylinder complemented by two 25-tonne RC254 cylinders. The compact RC1006 and RC254 cylinders have outside diameters of only 177mm and 85mm respectively. The cylinders were nestled within the box structures atop short stub columns supporting the base of the temporary stays until the time came for the lowering. Plate supports atop the box structures were released to permit the cylinders to take up the load. The cylinders were powered by ZU4 Enerpac electric pumps with pendant control and V66 check valves, one set for each of the 12 supports. The bigger RC1006 cylinders with a 168mm stroke controlled most of the descent. Where additional lowering was required, the two RC254 cylinders were used on each support to achieve the final position. The smaller cylinders with 102mm strokes were positioned on each side of the larger cylinder to provide additional stroke. Mr Burns says that once the cylinders took up the lift and the supporting plates were removed, each set of cylinders was lowered about six times in sequence. When the bigger cylinders had been completely lowered, the smaller twin cylinders were actuated to provide the remaining stroke until the roof was fully lowered. The entire operation took about a day, with the roof moving down evenly and in a controlled manner, supported reliably by the Enerpac system of cylinders, pumps and valves. With the roof resting in its final position, the temporary props could then be removed. Coates Hire Industrial Services provided the 12 sets of cylinders, pumps, check values, three-way manifolds and associated hosing, working in conjunction with supplier Enerpac Australia. Enerpac was represented by Enerpac Construction Industry Manager, Darryl Lange who provided technical backup and information for the operators. 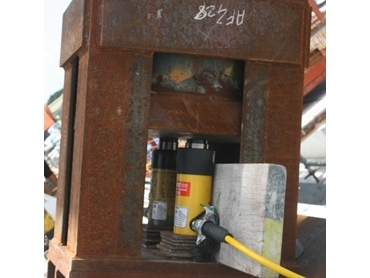 The hydraulic circuit provided by Coates Hire Industrial Services contained Enerpac V66 manual load holding valves for safety and control with in-line pressure gauges connected to ZU4 pumps. The high-pressure 700 bar hydraulic equipment employed at the Newcastle Stadium project is available throughout Australia and New Zealand from Coates Hire Industrial Services and from the national sales network of Enerpac, which is part of the global Actuant Corporation.